Solar panels, or solar modules as they are sometimes called, are typically installed on the roof. These panels are made up of photovoltaic (PV) cells, which convert sunlight into electricity or direct current (DC) power. The electricity or DC power from the solar panels is sent to an inverter, where it is converted into alternating current (AC) power for home usage or exported to Grid as per the system design. 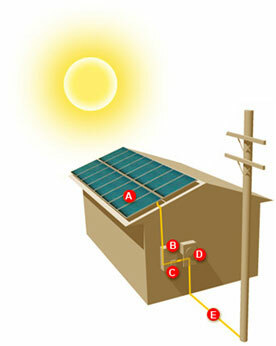 Stand alone inverters are used for off grid systems. Grid tie inverters are used when the installation is connected to a utility/power company supply line. Now, AC power travels from the inverter to the electrical panel. This power is now ready to use in your home. The utility meter continually measures your electrical supply; when your solar system produces more power than you need, the meter literally spins backwards, accumulating credits with the utility company that will offset your next bill. Your home remains connected to the utility grid to supply you with electricity when you need more power than your system has produced, such as at night.